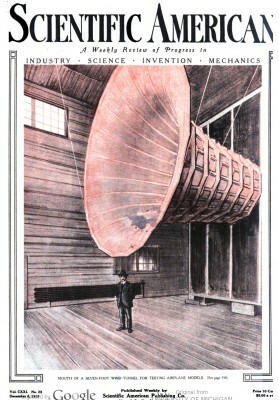 Scientific American : Balsa Wood Surfboard, 1919. FOLLOWING its extensive application in airplane construction, balsa wood is now being used for other purposes with considerable commercial success. beam as large as a railroad tie. In the accompanying views are shown two interesting applications of balsa wood to surf sports. 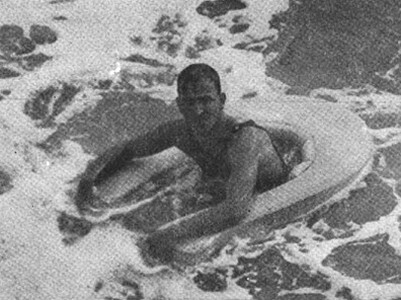 a horseshoe-shaped ﬂoat provided with straps affording a comfortable seat. The user can sit in comfort while floating about on the waves. for coasting on the waves, also made of balsawood. 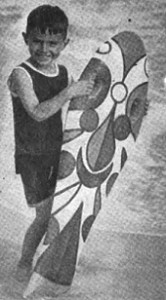 This surf-board is so light that it can be carried about by the little chap who is playing with it. The ﬂoating chair and the surf-board - two novel applications of the lightest of woods, balsa. Geoff Cater (2017) : Scientific American : Balsawood Surfboard, 1919.